HOME > art restoration: activities of the . . . The Studio’s activities are carried out in two separate centres responding to different needs of clients: a large workshop for the restoration of large artworks and a smaller workshop, not open to the public, for the restoration of paintings that require special security measures. Both workshops are equipped with effective anti-theft and fireproof systems, with alarms connected to police headquarters. 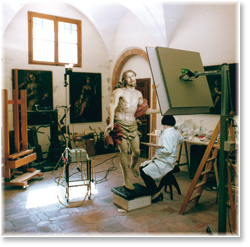 The Studio specializes in the conservation and restoration of paintings on canvas and wood panel, wooden statues and frescoes. We are able to consolidate both canvas and wooden supports; consolidate degraded and delaminated paint layers; clean the paint surface with the aid of the stereomicroscope with the latest pure chemical products, which are less aggressive for the artwork and less toxic to the restorer; integrate lacunae in the ground and paint layers with the system of chromatic selection, using reversible colours; apply protective varnishes to the paint films; remount the artwork on-site and restore the accessory elements, such as painted and gilded frames. 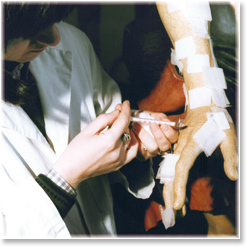 In particular, the Studio has specialized in vacuum techniques for consolidation of the paint and ground layers of panel paintings and the lining of paintings on canvas with glue-paste or synthetic resin. 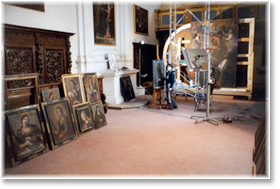 Extensive experience, research activities, technologically advanced equipment, and the importance of the paintings treated with our vacuum techniques place the Studio in the forefront in the field of restoration.